Since the creation of CocoaPods, the best thing to happen to the iOS community, by the iOS community, is fastlane. Initially developed by Felix Krause, with the contribution of tens of people, it allows developers to automate a bunch of tasks that are done manually, repeatedly, each and every time we wanted to release an update for our apps. If you aren’t familiar with fastlane, I suggest you to watch this presentation by the author. When fastlane runs, it will look for a few files inside the fastlane folder. This folder is created when you run fastlane init in the command line and configure the project. The most important is called Fastfile, where you configure different lanes you want, each one with different series of actions. For example, the lane can run tests, submit the app to TestFlight, submit to the App Store, and so on. The documentation for the Fastfile can be found here. To start, let’s tell fastlane which platform we are talking about, what is the minimum version of fastlane required for this one, and what are the initial environment variables that will be used in the lanes. Everything inside before_all will run before any lane is started. ☑️ Upload to Crashlytics (in my case, I didn’t want notifications, so I turned them off by passing the notifications: false parameter. Now, the tricky part: as CircleCI creates a new instance, temporary, for every build, it needs to be able to access the certificate and add it to the keychain of the CircleCI instance - we don’t want to create a new certificate for every build! 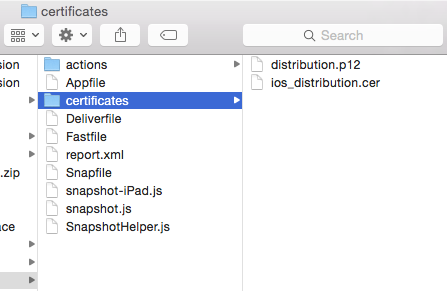 Taking this into account, create a new folder called certificates inside your fastlane directory; find the certificate you are using (or the one associated to the provisioning profile) and add it there. The other file you will need, is the .p12 key. To get it, open the Keychain Access app in your Mac, find the certificate, find the key, and select Export as shown in this image. Save as a .p12 file. Don’t forget that the password you use to export the key, needs to be defined as an environment variable - I’ll explain later how to do it. We are almost done with the Fastfile. Finally, add the import_certificates method. It will create the keychain in the temporary CircleCI instance, and import to it the files we just put in the folder. Don’t forget that we are using environment variables here like KEYCHAIN_NAME and KEYCHAIN_PASSWORD that must be setup in the before_all method - again, I’ll explain below how to do it. The full gist for this Fastfile can be found here. I also added a beta lane for sending to TestFlight (in my case, I wanted it not to submit the app to review, so I set pilot(skip_submission: true), and an appstore lane. Now, the easy part. We just need to tell CircleCI which lanes we want it to run in which conditions. ⚪️ Staging: whenever there is new code in the develop branch, it should run the lane fabric_silent ⚪️ Beta: whenever there is a new tag in my repository like beta-v0.7.3 or beta-v0.8, run the beta lane and send to TestFlight ⚪️ Release: whenever there is a new tag in my repository like release-v1.0 or release-v1.1, run the App Store lane to submit it. As we don’t want to store the certificate as plain text in the Fastfile, we will use the CircleCI environment variables, that are stored correctly. Add the CERT_PASSWORD name and value (your .p12 certificate password). Also, if you are using sigh as we mentioned above, also setup FASTLANE_PASSWORD as your Apple ID login password, to download the provisioning profiles. You should also set here the KEYCHAIN_PASSWORD to create and unlock the keychain for storing the certificate. ☑️ Enter source ~/.bashrc in Terminal to reload it without the need to restart it. Now you should have your most recent app waiting for you in the Crashlytics Beta app! Hooray! You can ping me @natanrolnik if you find any problems and I’ll try to help. 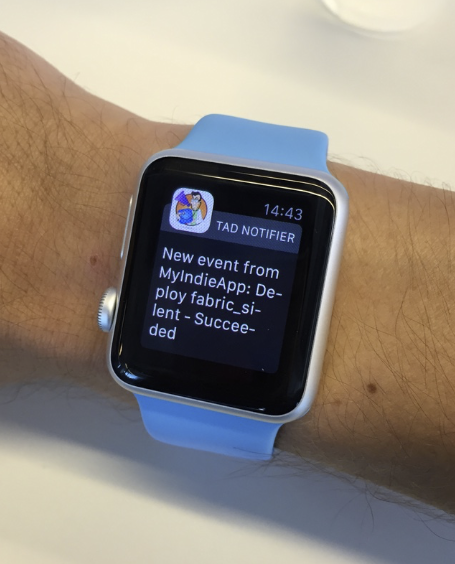 Wouldn’t it be cool if I could be notified every time a build finishes or fails? I created a small Parse app (with custom Cloud Code after save triggers) to send push notifications to my phone. You will need to setup Cloud Code and create an iOS app (to install on your phone) that will receive the notification. That’s it! I hope you enjoyed reading this article. Happy coding! And easy shipping!